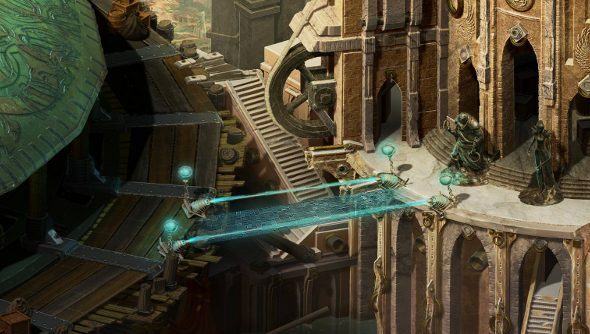 Torment: Tides of Numenera developer inXile has been agonising over their battle system for a good long while now. When I spoke with Kevin Saunders and Colin McComb just before the Kickstarter campaign, they had yet to make a decision on whether to craft a turn-based or real-time with pause system. And as the year draws to a close, they still haven’t made a decision. Now it’s up to the backers to make their preference known. Almost 75,000 of them. Real-time or turn-based, don’t choose the wrong one, or you’ll never live it down. Adam Heine, Torment’s design lead, explains why inXile opted to put it to a vote now. “Early this year, we had no preference, but as other aspects of the game’s design have solidified, a turn-based combat approach has been gaining momentum within the team. Rather than invest the energy in delving into the design of multiple systems, we wanted to talk with you first to see how you feel about our current preference.” It’s worth noting that the vote is for feedback, and while it will inform the final decision, it won’t actually be the final decision itself. I’d honestly be happy with either of them, though I’m leaning towards turn-based. Not only is it more consistent with Torment’s tabletop origins, it also encourages the sort of deep, tactical combat that made the likes of Fallout and XCOM so bloody wonderful. inXile’s blog details how each system would work, so you can get an idea of how your preference would function in-game. There’s also a massive chunk of information on the tides, Torment’s alignment system, which, although it has nothing to do with question of the combat system, is fascinating stuff.